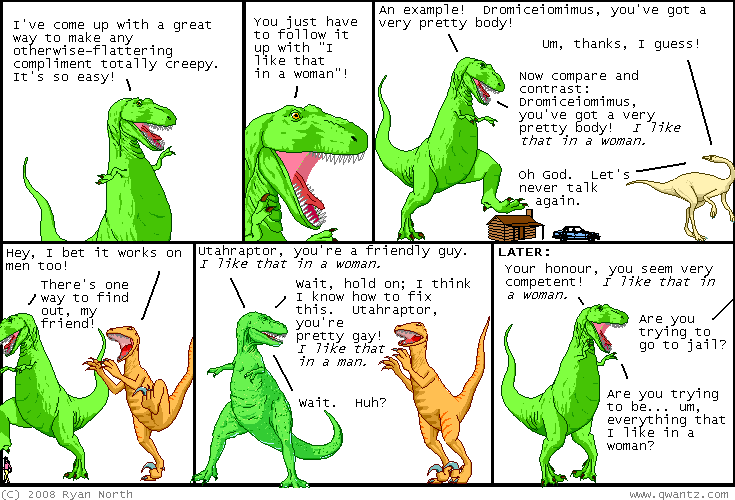 Dinosaur Comics - May 21st, 2008 - awesome fun times! –Today is a good day I think for preparing a special meal! May 21st, 2008: Thanks to everyone who emailed me about yesterday's comic, wondering if I'd read The Dark Knight Returns (I have: it's great! Highly recommended) or its sequel (not so much) or Kingdom Come (yay!) or seen Batman Beyond (it certainly had its moments!). What I was going for with T-Rex in the comic was that these are all out-of-continuity stories (or at the most generous, out-of-chronological orders stories in continuity, though I don't know how you could reconcile all four). It's certainly possible to tell good "Batman's old and this is his last mission" stories, but it's not possible to tell a "Batman's old and this is his last mission" and for it to be actually BE his last mission. There's always going to be a new Batman comic next month, and eventually he's going to be in his prime again. And since readers have a choice of "Batman's last mission" stories to choose from, there isn't a solid ending for the character: you can decide how you want to tell the story. That's actually one of the things I like best about storytelling with Batman: when you're doing a one-shot, you get to decide what Batman you want: is he just starting out? Older? Is he all serious about being Batman, or maybe not so much? Does he have a Robin? Which one? Does the Joker show up all the time or not at all? You can answer these questions however you want, and the audience will still buy that it's Batman: it may not mesh up with the Batman they have in their head, but they'll still buy it because they've seen all these different versions. I think it's neat that the character is so mutable! And tangentally, Robin actually gets closest to what T-Rex was talking about with soaps, wherein there's been several different people called Robin, all acting the same role but in different ways. It's not quite the same thing, but it does allow characters arcs to progress, if never conclude.